The complexity and subtlety of the Gwent Levels’ enduring drainage system is inspiring. Rainfall and run-off from the uplands has driven the creation and management of the ancient drainage system that maintains this wet landscape. A complex system of channels that work almost entirely under gravity carry surface water off fields through structures known as field ‘grips’ (shallow surface ditches in the field), into field-ditches and then into the interconnected reens that surround each field and main rivers. This water is then released at intervals into the Severn estuary at tidal creeks known as ‘pills’ through tidal flaps known as ‘gouts’. The whole drainage system in the Levels relies upon the sea wall. Historically the wall has retreated, with much of its present line dating from the late medieval period. In a total length of c.35km, there are many different styles and dates of wall which were steadily improved and modified between 1954 and 1974. However, following a heavy storm in 1990 when these sea defences were tested to the extreme, a 10 year programme of raising and strengthening the wall was undertaken. Map showing the complex pattern of reens and ditches around Redwick. © Crown Copyright. All rights reserved. RSPB licence 100021787, RSPB Permit Number: 60271. 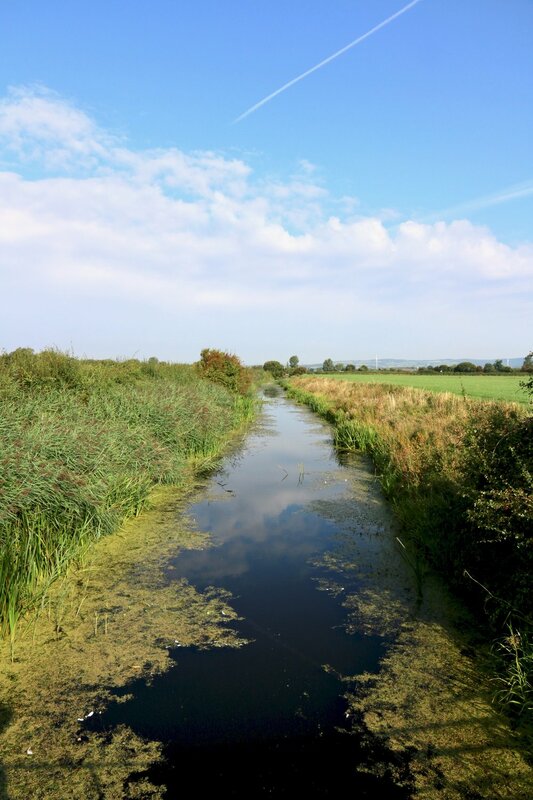 The first tier in the hierarchy of drainage channels that divide up the Gwent Levels are the rivers and the c.64 km of main reens in which upland streams have been canalised to run across the low-lying levels and out through a tidal flap system (gout) to the sea. Some of these main reens, such as Monksditch and Mill Reen, flow between raised banks onto which the periodic clearings of the reens are dumped. In places such as Monksditch near the Whitson sub-station and the north end of Blackwall in Magor, the reen sides are revetted by stone walls and timber facings. The next tier in the hierarchy of drainage channels are the c.137km of lesser reens. Water levels are managed in these reens by pens known as "stanks", in which wooden planks can be set to raise the water levels in summer and reduce them in winter. Another important feature are the "walls", which seem to have been low earth banks built on the uphill or seaward side of those reens dug to drain the back-fen. They provided additional protection from winter flooding to the better land behind. Another feature of these reens is the lines of pollarded willows planted to strengthen the bank sides. By far the largest tier in the drainage hierarchy is the c.1200km of field ditches maintained by individual landowners. Here, the clearance of ditches and management of the associated hedges may extend over a 10 to 30 year cycle. Traditionally, the ditches would have been kept open with occasional pollarded willows to help support the banks but not hedges, and the ditches used as ‘wet fences’ to keep the stock in. For example, in the lowest-lying back-fens, the fields are characterised by stands of reeds and isolated willows. The lowest tier of the drainage hierarchy is the surface ridging or grips. Skilfully created by hand digging or ploughing, these slight earthworks provide a network of shallow surface drainage gullies which take water off the field into ditches and reens. They do not survive in fields that have been under­drained and ploughed, which commenced from the late 1950s after improvement to the drainage system.